The Supreme Court of Kenya has just announced its decision that Uhuru Kenyatta's victory in the presidential elections should stand. Richard Trillo explains the background to Kenya's current political circumstances. How did the country react to the very close result in the Presidential elections? 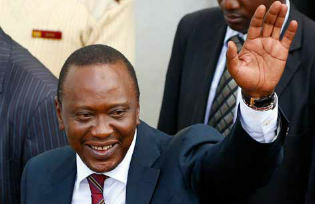 Those who voted for Uhuru Kenyatta (presidential candidate of the Jubilee Alliance coalition) saw it as a solid 7% win. Kenyatta got 50.07% of the vote, against Raila Odinga’s 43.31%. The supporters of Odinga and his Coalition for Reform and Democracy (CORD) saw it as the narrowest of margins since, to avoid going to a second round, the outright winner in the first round had to achieve 50% plus 1 vote, and Kenyatta passed that marker by just 8400 votes. Most of all, Kenyans were intensely relieved it went off relatively peacefully. There was an almost audible collective slow exhalation of breath in the first week after the results were announced on 9th March. As legal challenges on the results were mounted, that sense of relief slightly faded. Can you give us some background to these elections? These were the first elections since 27th December 2007. On that occasion, there was widespread vote rigging, a premature declaration that the incumbent Mwai Kibaki had won, and an immediate violent response from opposition supporters of Raila Odinga. A backlash from Kibaki supporters led to widespread communal violence in Nairobi, the Rift Valley and western Kenya. More than 1300 people were killed, tens of thousands injured and hundreds of thousands displaced. The country came closer to breaking apart than at any time in its history. Former UN secretary-general Kofi Annan brokered peace talks which eventually led to a Grand Coalition government, with Mwai Kibaki as President, Raila Odinga as Prime Minister and a huge cabinet that attempted to buy off all competing interest groups by giving every senior politician a cabinet job. Uhuru Kenyatta became Deputy Prime Minister (and Minister of Finance). Partly as a result of Kofi Annan’s mediation work, a new constitution was finally enacted in 2010 after a 67% yes vote in a national referendum. It has lots of progressive features, devolves a lot of power to 47 new counties, and makes a very clear separation of powers between the executive, the legislature and the judiciary – the courts are far more powerful now. And there’s an integrity chapter for political leaders, which should have made running for office impossible for anyone charged with a crime against humanity. There were eight presidential candidates in all – among whom veteran lawyer Paul Muite of the Safina party, Musalia Mudavadi of the United Democratic Forum, Martha Karua of the National Rainbow Coalition Kenya and Peter Kenneth of the Kenya National Congress have considerable standing in Kenyan politics. None of them, however, had any chance achieving a majority. The presidency was always going to be won either by the son of Kenya’s founding president Jomo Kenyatta or the son of his arch-rival Oginga Odinga. The elections were not just for the presidency: the new constitution meant elections were held simultaneously for the national assembly, the new senate and for the new county governorships as well as for county women’s representatives. There had initially been threats of violence as in previous elections but this has not been the case. What is different? Not threats of violence – at least not from the mainstream political groupings. But certainly fears. There were several reasons why they didn’t come to pass. Firstly the new constitution limits presidents to two terms, so Kenya was definitely going to get a new president – only the country’s fourth in fifty years of independence, but that reduced the entrenched bitterness about the incumbent and raised hopes of a fresh start. 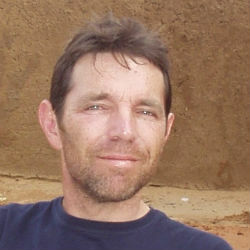 Secondly, the post-election violence (PEV) of 2007-8 led to a period of national soul-searching – apart from the moral dimension of neighbours setting on each other, the violent clashes had been played out under the eyes of the world’s media and had been economically ruinous, with tourism particularly badly hit. Kenya’s own media is quite free these days and there was a great deal of genuine grassroots determination that these elections should be peaceful and that the country’s integrity and economy should be maintained. The security forces were deployed across the country, and the potential for street protests was actively damped down, both by cautionary words from political leaders on all sides and by the evident threat of a swift official response. Most significant of all though, in preventing violence, was the fact that as a signatory to the Rome Statute, Kenya had referred a number of individuals to the International Criminal Court in The Hague over their alleged roles in organizing the PEV. When the names were revealed, the two key individual cases turned out to be Uhuru Kenyatta and William Ruto, Uhuru’s running mate in these latest elections. Supporters of Ruto, the most powerful political leader in the Rift Valley, attacked Kikuyu “migrants” during the PEV. The clear message to any possible organizers of violence in 2013 was that they could also face trial in The Hague. Raila Odinga did not admit defeat but decided to pursue his claims through the courts. Electoral observers have mostly said that the vote was fair. Did he lose fair and square? He claims not. His supporters claim not, and maybe he felt he owed them a hearing in the courts. And Odinga’s CORD alliance were not the only body to file a petition: the Africa Centre for Open Governance also sought to nullify the elections with a damning petition that detailed numerous alleged technical and organisational failures surrounding the elections. Kenya’s Independent Electoral and Boundaries Commission (IEBC) was in charge of US$100million worth of electronic voting equipment at the 33,000 polling stations. The system for delivering returns by mobile phone failed on 5th March when it was less than 20% complete. From that point on, votes were counted manually. 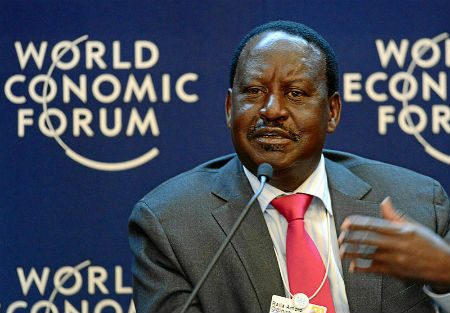 Odinga’s case rested partly on technical errors in the conduct of the election, and the way the equipment was used, and partly on the fact that, while voter registration closed officially on 18th December 2012 – by which time voter registrations in the Central Highlands (Kenyatta’s supporters’ heartland) and the Rift Valley (Ruto’s heartland), were already extremely high, reflecting a desire to “protect” registrants’ ICC-indicted ethnic leaders – registration continued unofficially until as late as February, and electoral rolls were artificially inflated in Jubilee areas. The Supreme Court thus had to weigh up the fair expectation that the election should be conducted transparently and according to the new constitution, with the huge potential for trouble that would be caused by throwing out a result that seemed to reflect the wishes of significantly more Kenyans than voted for any other candidate. The court ordered a re-tally of results from 22 polling stations to check whether the number of votes cast exceeded the number of registered voters, but it ruled out a forensic audit of the entire electronic tallying system. Some of the results were highly unexpected. In Mandera for example – an almost entirely Somali constituency in the far northeast – more than 95% of the voters turned out, and voted almost entirely for Kenyatta. Is voting along ethnic lines still a major issue? Can anything be gleaned from voting patterns? Are people predominantly voting along ethnic lines or is there a new middle class voting out of personal interest? Caution is required when talking about this, because many Kenyans rightly resent the lazy stereotyping of people into ethnic groups (invariably referred to as tribes in Kenya – the word doesn’t have any negative connotations there), and it’s important to recognise that many people have mixed backgrounds. There are 42 main ethnic (more strictly linguistic) groups in Kenya and voting among several of them has once again followed ethnic lines – as predicted in February in a highly controversial opinion piece by the veteran political analyst Mutahi Ngunyi, entitled “The Tyranny of Numbers”. Roughly 22% of the population is Kikuyu, Meru or Embu (the so-called GEMA group, after the former Gikuyu, Embu, and Meru Association), whose homeland is the central highlands, but who are widely dispersed across Kenya, especially in the Rift Valley. The vast majority of Kikuyu and related peoples voted for Kenyatta. Odinga’s ethnic group, the Luo, from the shores of Lake Victoria, but again widely dispersed and especially numerous in Nairobi, make up around 12% of the population and again voted overwhelmingly for him. The Kalenjin, who make up 15% of the population, consist of nine distinct ethno-linguistic groups. Their homelands in the Rift Valley and parts of the western highlands are areas that have also been home to large, scattered populations of Kikuyu-speakers since before independence and were the scene of some of the worst violence in 2007/2008. Ngunyi’s “Tyranny of Numbers” story made such claims for the inevitability of a Kenyatta win through the block vote from the GEMA group on one hand and the Kalenjin on the other, that the theory implied that only massive rigging on Odinga’s side could alter the outcome. So the Kalenjin vote was crucial? Yes, absolutely crucial. While in 2007 the Kalenjin came out heavily in support of Odinga and the opposition, this time they largely supported Kenyatta’s alliance with his running mate, William Ruto, a Kalenjin. 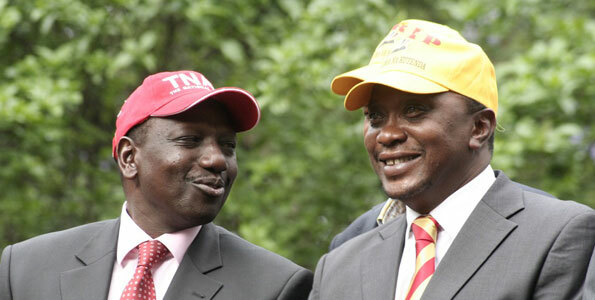 By bringing together arch political rivals, the Jubilee Alliance was portrayed by Uhuru, Ruto and their supporters as a celebration of reconciliation, embodying the best intentions for Kenya’s future. To their detractors it was the most cynical bit of political manoeuvring in the history of cynical political manoeuvres. The other big ethnic blocks were also very important: many Luhya from western Kenya, who make up around 14% of the population, came out in support of Odinga, as did the large majority of Kamba-speaking voters from the region between Nairobi and the coast, and the various coastal peoples themselves – at least those of them who actually voted. So what about voting on the coast? Did it have the same sort of pattern? The coast is a big issue for the new government. The word “coast” or “coastal” only appears four times in Jubilee’s 72-page manifesto and never in relation to the region’s deeply held grievances against up-country, largely Kikuyu, landlords and the dominance of outsiders in the local economy. The Mombasa Republican Council is a separatist movement that claims the coastal strip (leased in colonial times by the British from the Sultan of Zanzibar) was never legally incorporated into the Republic of Kenya after Independence. The MRC, which has a history of violence, was unbanned last year and encouraged to participate in the elections. Instead it campaigned for a boycott. On a low turn-out, Raila Odinga’s CORD swept the board on the coast, and even the once high-flying Najib Balala (former Mayor or Mombasa and former Minister of Tourism in the Kibaki government) lost the Mombasa senatorial race to his CORD rival after trying to position himself as Kenyatta’s lieutenant on the coast. Looking at the big picture, some call this a victory for democratic development and maturity in Kenya. Is there any truth in it? Some have also called it the result of a Peace Lobotomy, with millions of Kenyans prepared to sublimate a desire for justice and democracy in order to maintain peace in the country. The racism of low expectations is also at play here: many Kenyans are quietly furious that an opportunity for genuinely free and fair elections has in their view once again been hijacked by powerful interests in Kenya. There is also an ICC case hanging over Uhuru Kenyatta. Is this going to hinder his ability to govern? Is the ICC case faltering as charges against three of the original six ICC indictees have been dropped? How important is the case to Kenyans? Hugely important. Kenyans will be glued to their TVs and mobiles. The basis of the ICC’s PEV case against Ruto is that in 2007/8 he organized his Kalenjin supporters in the opposition to attack Kikuyu supporters of the incumbent Mwai Kibaki and evict them from their Rift Valley homes. The basis of the PEV case against Kenyatta is that he in turn organized Kibaki’s Kikuyu supporters to retaliate against Kalenjin and Luo supporters of the opposition. The case against Kenyatta will do more than hinder his ability to govern: if he is frequently in The Hague, it will mean that he has to delegate much of his day-to-day work to others, and presumably to an inner circle. Many observers have presumed the alliance between Kenyatta and his former rival Ruto would not last long in any case, and it might seem that Ruto, the first to stand trial, starting at the end of May, could find himself cut loose quickly if the trial casts an unwelcome light on Kenyatta, who follows him to The Hague in July. Whatever comes out of the Ruto trial, however, is likely to be just as damaging, if not more so, to Odinga’s reputation. During the last elections, Ruto was part of Odinga’s Orange Democratic Movement opposition, and in fact held talks with him as recently as December 2012 to discuss running as his vice-presidential partner in the March 2013 elections before deciding at the last minute to run with Kenyatta. Moreover, Kenyatta probably can’t afford to alienate Ruto, without whose Kalenjin support base he has no government majority. The two are shackled together in an “alliance of the accused”. Two of Kenya’s original six ICC cases (against former ODM chairman Henry Kosgey and former Police Commissioner Mohammed Hussein Ali) were dropped at an early stage for insufficient evidence. The decision by the court on 11th March to drop the case against Francis Muthaura, the former Head of the Public Service and Secretary to the Cabinet came about after a key witness recanted part of his evidence. The remaining three cases against Kenyatta, Ruto and radio presenter Joshua Sang, look set to go ahead. It has been suggested that the ICC case will mean that that both Kenya and Uhuru Kenyatta will be ostracized by the international community until the matter is settled. Kenya could face international sanctions if Kenyatta refused to abide by the authority of the court. But Uhuru Kenyatta and William Ruto have skillfully turned the election into a referendum on the ICC, and by extension on the role of the NGOs, foreign diplomats, foreign media and global observers in general who they claim have interfered behind the scenes to ensure they were indicted, in order to secure support for Raila Odinga in what has been the elder statesman’s third bid for the presidency. Odinga’s thin connection with Barack Obama (Obama’s father was a Luo) further helped to label him a Quisling in some quarters. On every level Kenya is critically important to global interests in Africa, meaning that it’s likely that Kenyatta and Ruto will have a relatively strong hand in negotiating the way their trials are conducted. It’s known that their defence teams have requested transferring the trials to East Africa – and even conducting them by Skype, which the ICC has ruled out. What were the issues in the campaign? Has the issue of devolution of power from central to regional centers been important? This election wasn’t primarily a fight about issues: it was an election to prove that Kenya can perform as a democracy. Even more significantly it was a flight from fear. The trending twitter hashtag #ChaguaAmani – Choose Peace – was especially popular with Kenyatta supporters. The critical question seems to be: when does a vote for peace become symbolic protection money? The scan of an anonymous letter to the highly respected Chief Justice Willy Mutunga – warning him and “his mzungu [white] godfathers and their local political bootlickers that if they push us the wall, we will invade white farms and grab them…Be warned. Touch Uhuru and we burn Kenya down” – was widely distributed and discussed. It could have been a genuine threat from the Kikuyu terror gang, Mungiki (widely mixed up in central highlands politics), but I think it equally might have a been an attempt to tarnish Kenyatta by association. Broadly, Kenyatta and Ruto fought the election on a nationalism and self-determination ticket, spinning the ICC cases against them as western interference in Kenyan affairs and creating an anti-Western mood that said “we don’t need you, we can stand up for ourselves, stop trying to control us with your neo-Colonial ways, this isn’t the British Empire”. Voters suffered a widespread case of selective amnesia over the fact that it was a Kenyan commission of enquiry – the Waki commission – which had referred six PEV cases to The Hague after failing to find a way to bring them to trial in Kenya. Jubilee’s anti-ICC campaign was created by a British PR firm, BPT Advisers, who specialise in reputation management for the more challenging kind of political and government client (they’ve also worked for the governments of Rwanda and Azerbaijan). They succeeded in smearing the British High Commissioner with the damaging accusation that he was meddling in Kenyan politics. It’s a no-brainer that Kenya’s partners would much prefer not to have to deal with a government led by ICC indictees, which will make everything about the relationship very difficult. The Germans, who are another key partner, are much more outspoken, but the British as former colonial rulers were the obvious choice of villain. But you asked about the issues, and behind the fear and campaign tactics, there were important real issues that did occasionally get aired. The most pressing issue is land, the issuance of title deeds in traditionally community-held districts and addressing historic disputes and injustices, which litter the country. Kenyatta made much of this at the Jubilee Alliance’s manifesto launch, even promising to issue title deeds in the huge Nairobi slum of Kibera (part of Odinga’s parliamentary constituency), but the issue featured less prominently in Jubilee’s colourful manifesto document, which focused heavily on unity and broad-brush statements. The elephant in this particular room is the Kenyatta family’s own vast wealth and land holdings, often estimated at more than 500,000 acres (2000 square kilometers). The more pragmatic main planks of CORD’s shorter manifesto were jobs and food security. The devolution question, and elections for county governors and senators conducted some of the political heat away from the presidency by creating regional power centres in the most important county capitals. CORD won governorships in many key urban areas, including Mombasa and Kisumu. Most importantly they won in Nairobi, where their heavyweight nominee from the business community, the increasingly presidential-looking Evans Kidero, seems to have appealed to many middle-class Kikuyu who voted him governor while voting for Kenyatta as president. What about Kenya as a regional power? What is Kenya’s standing with its neighbours? What is its geo-strategic importance? Kenya’s relations with its economically and diplomatically weaker neighbours are mixed. Nairobi is by the far the biggest city in East Africa, and Mombasa the biggest port. In Somalia, Kenya’s military intervention to remove Al-Shabaab jihadists and prop up the new government in Mogadishu has reduced tensions in northeast Kenya, which hosts hundreds of thousands of Somali refugees. Relations with Ethiopia are mostly good, but ethnic tensions in the border districts and really bad road infrastructure limit their benefit. The new country of South Sudan is also a Kenyan ally and Kenyan traders and entrepreneurs are responsible for much of the business in the capital, Juba. Kenya has wooed its neighbours to the north with the cornerstone of its much vaunted Vision 2030 (a grandiose national development plan), the “Lamu Port South Sudan Ethiopia Transport Corridor” or LAPSSET – a hugely ambitious infrastructure project linking a new port at Lamu with an oil pipeline, roads and high speed railways from Juba and Addis Ababa. Sceptics point to the existing crowded highway and dilapidated railway track between Mombasa and Nairobi and ask who would fund such fantastic schemes through the desert. Uganda is a touchier partner, heavily reliant on Kenya as a corridor (along that furred arterial road and railway) for almost all its international trade, and suspicious of Kenya’s economic muscle. 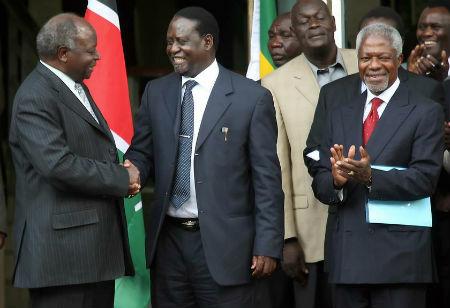 Kenya and Tanzania also periodically have rather strained relations (often disagreeing over common access to tourist attractions), although President Kikwete worked with former UN Secretary General Kofi Annan to broker the power-sharing coalition between Mwai Kibaki and Raila Odinga that has ruled the country since 2008. Although all three countries are part of the East African Community (together with Rwanda and Burundi), economic protectionism is more common than free trade. 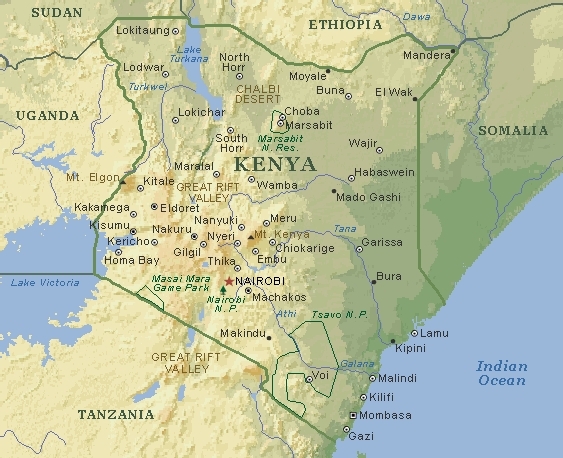 Geo-strategically, Kenya is very much on the map. In the first two decades of independence, the country was viewed as a natural Cold War ally at a time when Uganda was undergoing the turmoil of the Amin and Obote dictatorships, and Nyerere in Tanzania was experimenting with idealistic socialism. Kenya has always hosted a large British military training facility at Nanyuki, near Mount Kenya – though British troops tend to keep well clear of internal conflicts and security issues. Al-Qaeda’s attacks on the American embassies in Nairobi and Dar es Salaam in 1997, followed by the 9/11 attacks in the USA, crystallised the view that Kenya, bordering Somalia, should be a frontline ally in the “Global War on Terror”. Kenya’s commitment of its defence forces in Somalia since 2011 (Operation Linda Nchi – Protect the Country) was soon followed by US drone and air surveillance cooperation and offers of assistance from other countries, including Israel. Evidence that the trade in poached elephant ivory and rhino horn (the latter now commanding a retail price of more than $50,000/kilo) is funding Al-Shabaab raise the stakes further. There’s also now oil to consider. Very significant oil reserves have been discovered in northern Kenya and we’re now waiting to see how commercially viable their extraction might be. How are relations with its former colonial masters the British? Relations with the UK are being sorely tested by the election of another UK – Uhuru Kenyatta. The Kenyatta-Ruto campaign, concocted by British PR company BPT Advisers, spun the ICC charges against them into a conspiracy by the British and others to stymie the hard-won political freedoms of Kenyans to elect their chosen leaders. The Jubilee Alliance even demanded the British explain an “abnormally high influx of British military personnel in the country” – in fact the normal movement of British troops arriving and departing. The British High Commissioner has been tight-lipped about the result, and following protocol did not directly congratulate Kenyatta on his win. How is life on the ground? Has it been business as usual or do Kenyans feel in limbo politically? Until the Supreme Court adjudicated on CORD’s petition, there was indeed a continuing sense of limbo, and much consultation of the constitution to assess how the next steps – whatever they are – should be played out. The possibility that a digital scam of some kind may have been perpetrated has left Kenyans on all sides feeling patronised and frustrated – Kenyatta’s “winning” supporters less happy than immediately after the election, sensing the possible hollowness of their victory, and Odinga’s “losers” feeling duped and resentful. How much confidence do Kenyans have about their legal system and the role of the police? Violent crime has apparently increased in rural areas as police deployed on election duties at polling stations and on street corners in readiness for street protests were unavailable. But even in “normal” times, there is very little trust in the police, whose blatant corruption and bribes industry – especially evident on the roads where routine roadside police checks are little more than extortion posts – is notorious and goes almost unchallenged. Drivers complain about increases in the kitu kidogo (“something small”) they have to pay, rather than demanding an end to such illegal practices. Moreover, police open fire in public frequently and quite indiscriminately, with dozens killed around the country every month – the guilty, suspects and innocent bystanders – as police try to intercept robbers, car thieves and those favourites of the local press, “suspected thugs”. Shoot first, and forget to ask questions later seems to be their modus operandi. Meanwhile, for fifty years now, Kenyans have tolerated the lowest conceivable standards in public life: a ceaseless tidal wave of corruption stories fills the media, as public officials use their positions for personal enrichment, and questions of where the money went are treated with minimal seriousness and rarely followed up by police. There are, however, some real glimmers of hope in Kenya’s justice system. 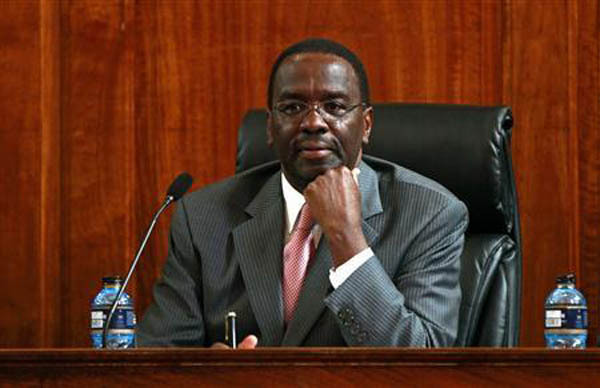 It was Kenya’s own Waki Commission into the post-election violence of 2007/8 that referred Kenyatta and Ruto to the ICC, and the creation of the Supreme Court in 2011, with the appointment of the widely respected Chief Justice, Willy Mutunga – who has a civil protest background – has greatly bolstered the standing of the legal system. Merely the existence of the Supreme Court has helped to maintain peace during the elections, reminding participants with grievances of where they should take them. On 30th March the Supreme Court ruled against Raila Odinga’s petition, declaring that the results of the 4th March 2013 elections should stand. What has the reaction been? Relatively measured. There were spontaneous celebrations in various highlands areas, especially Kenyatta’s home town of Gatundu, but heavy rains cut short celebrations in Kalenjin areas. In the city of Kisumu, Odinga’s heartland, angry youths came out on the streets and police opened fire with live rounds, killing at least two people and injuring several more. There were similar localized riots in some of Nairobi’s slums, with three people shot dead by police. The mood on the coast was muted. The court’s 340-word verdict only announced its conclusions, that the elections “were indeed conducted in compliance with the Constitution and the law” and that Kenyatta and Ruto “were validly elected” as President-elect and Deputy President-elect. A detailed judgement containing the reasons for the Supreme Court’s decision will be released within the next two weeks. It’s not over yet and, as more details come out of the conduct of these very complicated elections, we shouldn’t mistake calm for peace. Kenyatta may now claim a double mandate, having been victorious both in the elections and in the Supreme Court. Yet his 8400 majority was the narrowest of wins, and over the next few months that wafer-thin endorsement is likely to amplify the voices of the millions who did not vote for him. He will find the country’s newly devolved political map, with its powerful county governors, re-enfranchised electorate, vocal media and trusted judiciary, a vastly different landscape from the one in which his father operated fifty years ago.